There are two City Council meetings this week, tomorrow (February 5) at 6:30 PM the second “retreat” on Council priorities, and then on Wednesday, February 6 our regular weekly meeting. Priority-Setting Retreat: https://takomaparkmd.gov/meeting_agendas/city-council-retreat-day-2-february-5-2019/. This second and final retreat -- open to the public -- was originally scheduled for last week, but was postponed because of the snowy weather. This is part of our annual priority-setting exercise, and as I mentioned in last week’s blog, the Council is seeking to identify a small number of top priorities on which we’ll most heavily focus this year. Later on, most likely in March, we’ll vote on a resolution formally adopting our decisions on priorities. To reiterate what I noted last week, among the main areas I’m hopeful the Council will give special attention to this year are housing and economic development; moving forward on racial equity; taking action on climate change; County tax duplication; and addressing problems connected to utility projects in the City. 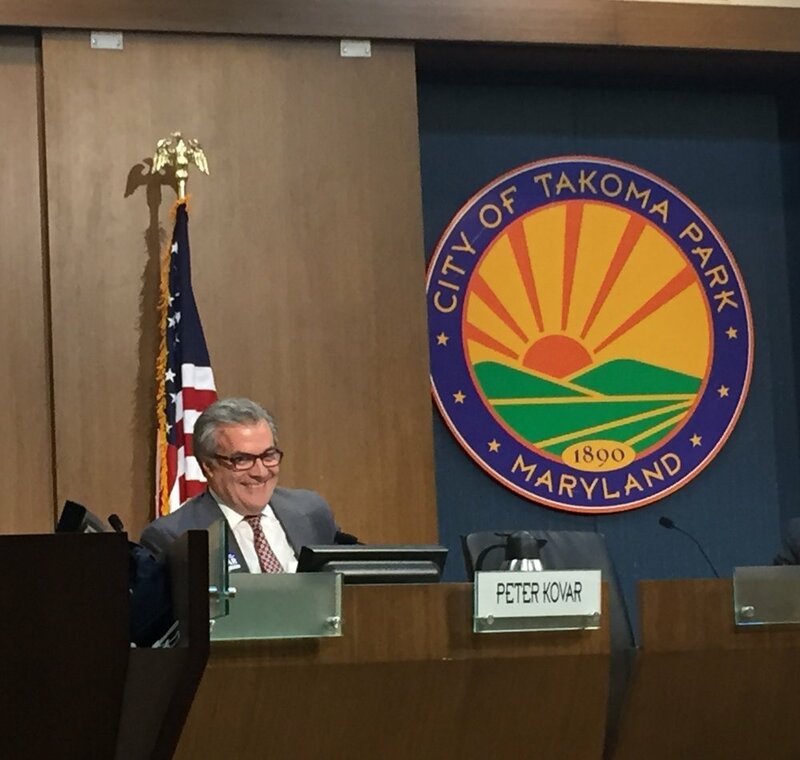 Council Meeting: https://takomaparkmd.gov/meeting_agendas/city-council-meeting-agenda-wednesday-february-6-2019/. There’s one vote this week, on the City’s Emergency Operations Plan, which we discussed last week. I’ll be voting in favor of the plan. We’ll also have a presentation from the Executive Director of the Greater Washington Council of Governments. Finally, there will be work sessions on a possible amendment to the resolution on Montgomery College’s Math-Science Building relating to the width of the Fenton Street right-of-way, and a proposed budget amendment. Office Hours. I’m holding office hours at Takoma Bevco tomorrow (Tuesday) from 3:00 - 5:00 PM. You can stop by to discuss any local issues or concerns. No appointments needed. Takoma Junction. https://documents.takomaparkmd.gov/initiatives/project-directory/Takoma-Junction/20190131-CM_Updates_on_NDC_Submission.pdf. As outlined in the statement issued by the City Manager last week, based on feedback from County planning staff, zoning restrictions at the Junction site may require NDC to submit a smaller building design. At this point it’s not clear exactly how this process will move forward, but if there’s a significant change to the project design, the Council will have to consider and vote on it. The details of NDC’s submission to the County will likely be posted on the County website in the near future. Silver Spring Intermediate Park. https://www.montgomeryparks.org/projects/directory/silver-spring-intermediate-neighborhood-park-improvement-plan/. The County is soliciting public input on the proposed improvements to SSI Park (located between Philadelphia and Boston Avenues near Montgomery College). The deadline for commenting is February 18. Pepco Project. I talked on the phone and emailed with representatives of Pepco and their contractor on Thursday about the status and plans for their ongoing work in North Takoma. One piece of very bad news from those exchanges is that Pepco hasn’t completed its work on Takoma Avenue in the area near Baltimore and Albany Avenues, and is planning to conduct excavation work there when the weather gets warmer along a 400 foot section of the roadway. This work will once again involve street closures and detouring. Needless to say, this is quite different from what we had been told earlier, and of course extremely inconvenient for residents who have generally responded to the ongoing work in a gracious manner. I hope to be able to share more information soon on the cause of this schedule change and the upcoming plans. In addition, there are of course challenges connected to other parts of the Pepco project (including at Eastern and Cedar Avenues near the Takoma Metro Station), not to mention the WSSC water main project on Philadelphia Avenue. I’ll be consulting with City staff and my Council colleagues on how best to proceed, whether to have a public meeting or Council session on these matters, etc. Meanwhile, as noted, the broader question of utility company operations within our borders is a Council priority I’m hoping to elevate in our retreat discussions this week. COG Presentation: https://documents.takomaparkmd.gov/government/city-council/agendas/2019/council-20190206-1.pdf. The City is an active member of COG, with most of the City Council members serving on COG committees (I’m on the Metropolitan Washington Air Quality Committee). We’ll be hearing from Executive Director Chuck Bean about COG’s activities and opportunities for the City to collaborate with the organization. Montgomery College: https://documents.takomaparkmd.gov/government/city-council/agendas/2019/council-20190206-3.pdf. In their review of the proposed Math-Science Building design, County staff have noted that the Takoma Park Master Plan classifies Fenton St. as an arterial road with the potential for a right-of-way up to 80 feet wide, well beyond the width of the existing roadway, sidewalk and Metropolitan Branch Trail. So, the question is whether -- as part of the Math-Science Building project -- the City would be interested in having a wider right-of-way. In making that determination, among the key points to consider are possible future impacts on transportation in the City, as well as the positioning of the Math-Science Building. Budget Amendment: https://documents.takomaparkmd.gov/government/city-council/agendas/2019/council-20190206-4.pdf. As often occurs, various budget items have ended up being delayed or cancelled due to unanticipated events. When such changes relate to expenditures previously adopted by the Council, they can’t officially go into effect unless we approve them. This amendment (the third of its kind in this Fiscal Year) includes a number of individual changes that we’ll be discussing, with a vote on them taking place in a future Council meeting. As always, let me know if you have questions or comments about any of the issues discussed in this message.